One of our biggest concerns with having our kids at school, as folks focused on preparedness living, is that we won’t be there in a time of crisis to help them out. So it’s especially important to prepare our children the best that we can, above and beyond what the school is able to do for them, and what their Everyday Carry (EDC) can do. But why would you even need a mini Emergency Kit? Don’t the schools provide enough? You don’t show up (or whomever their ride is) or their bus is wrecked on the way home. From our experience, schools aren’t really prepared for long-term lock downs or disasters. Rarely does a classroom kit contain enough water and food for an extended time for an entire classroom of children. So it’s prudent to help your child. Recently, I was in a classroom and saw an emergency bag laying on the floor. It was just tossed up against a corner. Because I was alone, and doing what I do, I decided to take a peek inside. What I found was a sad example of what too many classrooms are doing. The contents were as follows: A sleeve of saltines, a 12 oz bottle of water and 8 dixie cups, 2 bandaids, and a flashlight. Oh..and a magnetic window cover for the door. Sure…this would work for a 20 min. emergency. But what if if were longer? What if we were looking at a natural disaster or a lock down that lasted a day? Or…what if this was a bus accident? There is nothing more than a simple first aid kit and fire extinguisher on most buses. 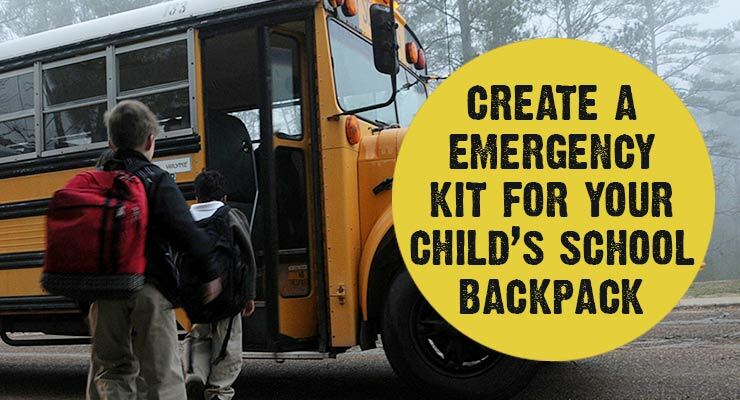 One of the ways we can do that is to create a mini-Bug Out Bag for our kids. This can be something they keep tucked away in their lockers, at the bottom of their book bag or in their desk or cubby at school. It needs to be somewhere easily accessible to them without breaking the rules of the school. Emergency Whistle (and don’t skimp on this — cheap whistles often don’t work or are not strong enough to be heard in a lot of noise. We made that mistake when we first created our kits and found out they just don’t work when needed). Cell phone (this may be an issue for some schools, but we would have our kids take a throw-a-way cell in their packs, just in case). Emergency Blanket – while the cheaper mylar blankets seem a better buy, they are pretty flimsy and tear easily. This can serve as a poncho, something to sit on, to keep warm with, etc. Chapstick and antibacterial lotion hand cleaner. Photo album – you can create a small photo album for your child to have photos of the family to help bring them comfort. It is also a great ID item in the chaos of pick up after to have a photo of you with them for rescue workers to help release to the appropriate guardian). For older kids or if you’re wanting to pack a better bag, here are items that may or may not be approved by a school district, and you can decide how you want to handle it. You can store supplies in a zip top bag, a small baby wipe box, a pencil box, or if you’re really good at packing small supplies, a large Altoid box! Just make sure your younger children understand that this isn’t for play and that they aren’t to pull it out at snack time or recess, nor discuss with other kids that they have ‘toys’ in their packs. Please also follow the rules of your school about what can legally be brought onto campus and what you can do about it. Only you can decide that for your child. It was mentioned in the comments that generic supplies for a whole classroom should be the way to go and that it can be dangerous to have this only for your child. But what school really has all of these supplies on hand for all children? Not any that I know of. As a parent, it’s my responsibility to make sure that my child has what they need, if at all possible. This goes not just for the classroom, too. If they ride a bus, these items may be useful for your child if there’s a bus wreck, or if they have an accident riding home from school on their bike. Take a look at a bigger picture and see how you can help your child and don’t rely on the system to do it for you. How can we support our schools to be more ready? Ask your child’s school about the readiness plan they have. Don’t be worried if they are a bit vague as they may not want to break security protocols. But pin them down on the plan that they can share. Talk to your child’s teacher about his/her course of action of the school’s is not great. Yes, we want our schools, churches, day cares, and places that keep our children to be ready for emergencies … but don’t leave it to them to do it. Be proactive, teach your child HOW to use the items in their emergency kits, and give them the ability to be ready for anything. Your Thoughts: What other items would you include in your child’s bag? Enter your email and click submit to get your FREE Family Emergency Binder Starter kit. Take control of your family's preparedness today!